Aberdeen International Airport was part of BAA who owned Heathrow, Southampton, Stansted, Glasgow and Aberdeen, but BAA was ordered to sell off their airports to increase competition in the market. Ferrovial and Macquarie now own Aberdeen, Glasgow and Southampton Airports and BAA is now just Heathrow. Chaos won the Aberdeen pitch and started working with them in December 2012. Chaos assist managing the main airport eCRM and for the white labeled car park called Park & Depart. Aberdeen had a small database, when Chaos started, based of contacts acquired through parking bookings. In 2013, Aberdeen introduced free Wi-Fi in exchange for users’ email addresses, which grew the database dramatically. 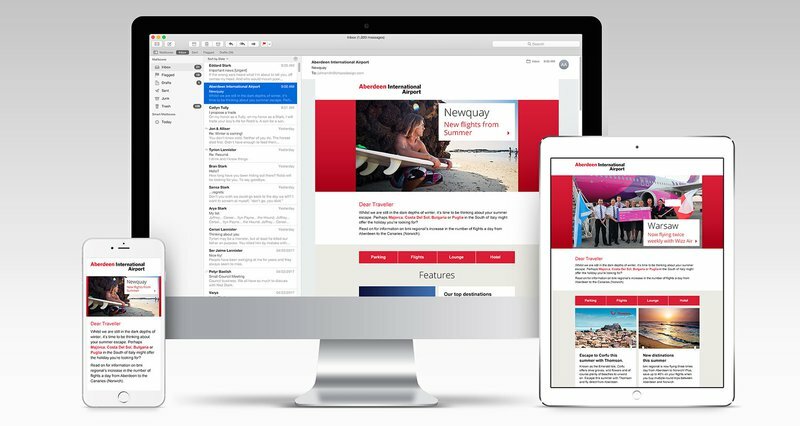 Once the database reached 250,000 contacts, we recommended Aberdeen to tailor messaging to increase engagement as well as move to a more sophisticated eCRM platform, Pure360 (which Chaos setup and implemented). In December 2015, Aberdeen pushed live the automated customer journey, developed by Chaos.